A simple sliding action exposes tip of razor edge for most do-it-yourself cutting projects. Cuts corrugated cartons, cardboard, paper, wallcovering, etc. All-metal fabrication. Uses a standard single-edge razor blade. Heavy-duty, solvent resistant polypropylene handle molded right onto head. Use to trim wallcovering and for hundreds of home cutting projects. Uses a standard single-edge razor blade. Includes 5 blades. Use to scrape paint and stickers from glass, tile, etc. 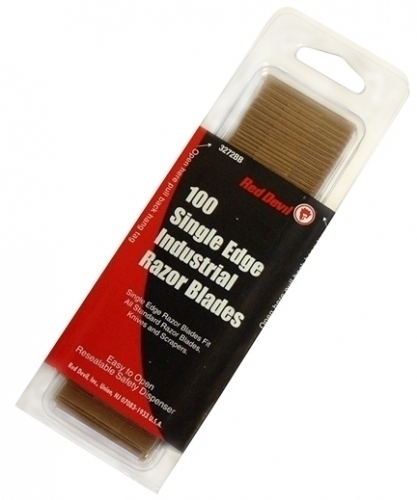 Uses a standard single-edge razor blade and features an easy snap-open feature for blade replacement. Perfect for scraping window/glass and stickers as well as many home/workplace scraping jobs. All-metal construction with nickel plate brass eyelets. Push/pull action locks blade in place for use, retracts for safe storage. Uses standard razor blades.